The pace of polling picked up a bit on Wednesday, but of the 18 surveys in 11 states, 12 were in the field on the day/night of the final debate on Monday night. Just the trio of Rasmussen surveys were conducted following the debate. This isn't to suggest that the last debate from Boca Raton will have a huge impact on the course of the race, or even affect it much at all. Rather the intent is to point out that we have yet to really see the expected wave of polls that we are likely to get now that debate season is complete. On the whole, the polling data released on Wednesday offered something of a mixed view of the state of the race, but in some of the key toss ups, the numbers were favorable to the president. The leads were certainly narrow, but the polls pointed in the direction of the president more often than not. There wasn't much to write home about in the University of Arkansas poll of the Natural state. Believe it or not, Arkansas is solidly in Romney's column and the new data -- nice though it was to have -- confirmed what we already knew and really only slightly changed the FHQ weighted average that had existed prior. Following on the heels of a day yesterday with two polls released from the Nutmeg state, the extra poll today from Quinnipiac did essentially what the Arkansas poll above did. 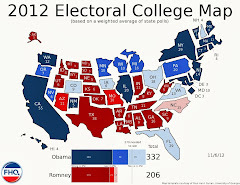 It confirmed the low to mid-teens lead the president holds in Connecticut. That said, this poll did overstate Obama's share of support relative to the FHQ average in the same way that the Rasmussen poll found a higher Romney share. That drove a couple of polls that were wider or more narrow, respectively, than the weighted average share of support established throughout the year. Mark Mellman has branched out beyond Nevada polling to Florida (and Virginia) today. The results are on some level consistent with the Obama +7 the firm found in Nevada. The order is correct anyway, but Virginia is probably not seven points closer than Nevada nor is Florida eight points closer than the Silver state. But if this series of polls is tilted toward the Democrat in this case, then one could see a Romney +2 in Florida or a Romney +1 in Virginia concurrent with a +5 in Nevada. That may overstate the gap between the two peripheral South states and Nevada a bit, but it is not too far out given the typical polling variation that we see. Obama gained a handful of points over the last WBUR poll of the Bay state while Romney held steady. That really is about all one can say about a poll that confirms a wide margin in Massachusetts; a lead that has been repeated in a slew of polls emerging from an otherwise noncompetitive state. This one is blue. Nothing more, nothing less. The Foster McCollum White/Baydoun polls of Michigan have tended to show a much narrower Obama lead in the Great Lakes state than other polls conducted in the state over the course of 2012. In some instances this has been a function of understating Obama's share of support relative to the FHQ weighted average share for the president. But in other instances, it is a matter of simultaneously overstating Romney's share and understating Obama's. Given the other polling information that has been made public recently, this poll falls more into the latter category. In fairness, though, this poll will only be an outlier when and if no other similar information comes out of Michigan in the next few days. The story told through the polls in Nevada today was one of very little change. Neither the Rasmussen nor the PPP survey showed any significant movement since the last time the two firms were in the field in the Silver state. Importantly, both firms find the president awfully close to the 50% mark there and combined with consistency of that over time, that is noteworthy. Thought the FHQ weighted average has not closed that much, the days polling in the Granite state was reminiscent of the back and forth, Romney-leads-Obama-leads polling we have seen in states like Virginia and to a lesser extent Colorado in the time since the first debate. Of course, both the Rasmussen and Lake Research surveys broke from the limited string of tied and one point margins that had become the norm in New Hampshire since the first debate. Again, the average is closing -- closing in on Ohio in particular -- but New Hampshire is not quite on par with the Tier 1 states we discussed yesterday. ...yet. As someone said on Twitter in response to my retweet of these results from Marist poll of the Empire state, "#Breaking!". Indeed. As was the case in Arkansas and Massachusetts above, this poll didn't break any news much less the conventional wisdom regarding the state of the race in New York. 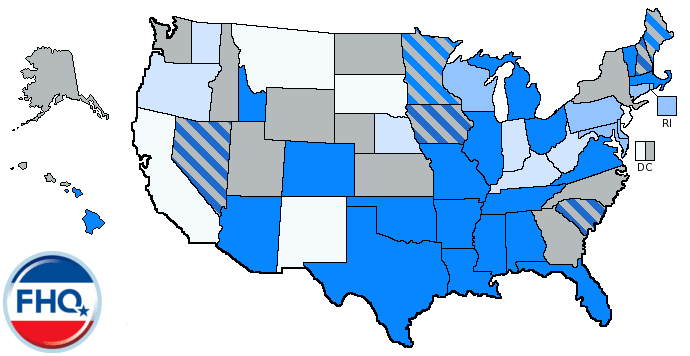 It is a blue state to the extent that Arkansas is a red state. The weighted average margin in each is approaching 25 points. The four polls out of Ohio were a microcosm of the state of recent polling in the Buckeye state. It ran the gamut from tied to about a three point lead for the president with one outlier thrown in from Time magazine for good measure. The Survey USA poll ran the closest to where FHQ has the Buckeye state in our weighted averages. Obama has led 15 of 23 post-Denver polls in Ohio and of the other eight, Romney held the advantage in three and the remainder were tied. That is indicative of an Obama edge, but a small one. Tossing out the somewhat dated ODU poll (It was in the field for almost a month. ), the polling in the commonwealth favored the president today. Of course, one of those polls was from Zogby which has tended to favor the president and the other was from a Democratic pollster. Still, that Mellman survey was not that far off from other polling we have seen in Virginia in October. But for once, this was not a day where the candidates traded leads in Virginia polls. Mason-Dixon had yet to go into the field in the Badger state in 2012 until this survey, but found the president ahead by a margin roughly on the lower end of the range of polling that has existed in the state since the first debate. That is, it found the race to be at Obama +2 when the established range has favored the president anywhere from 1-4 or 5 points. Consistent with at least one view of the state of the race in the time since about a week after the first debate, things seem to have leveled off in some respects in terms of the movement toward Romney. To the extent that compression of the averages continues, it has slowed down considerably here at FHQ. The averages in those Tier 1 states (Colorado, Florida and Virginia) have only very gradually tracked down while continuing to hold (very tenuously indeed in the case of Florida) in the Toss Up Obama category. Florida continues to teeter on the brink of pushing across the partisan line into Romney territory, but has remained resistant under the weight of the past polls. Though that leveling off has been felt in some other states, it is most consequential for now in those Tier 1 states. Needless to say, if the story is leveling off then it is indicative of a status quo day here at FHQ. In most of the toss ups, the new data only reinforced the current averages. Only in New Hampshire did things track down noticeably behind the strength of a Rasmussen poll that showed Romney with something greater than a one point lead; a gap that has been the norm in the Granite state. 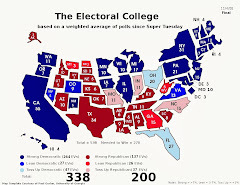 The map stayed the same, the tally stayed the same and the Electoral College Spectrum, too, stayed the same as it was a day ago. Ho-hum. 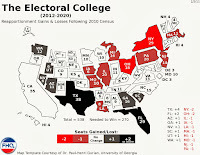 The Watch List also was comprised of the exact same group of eight states with the five hovering around the toss up lines continuing to be the states from which to watch for new polling the most.